Provided photo In recognition of Rett Syndrome Awareness Month in October and in honor of Leah Hatton of Tipp City, the employees of Barnes Wildlife Control will be wearing special purple work shirts. Leah’s mother Lisa works for the company and Leah recently made a visit to BWC. Rett syndrome is a rare neurological disorder that almost exclusively affects girls. It typically develops in the first two years of a child’s life and can lead to severe impairments. 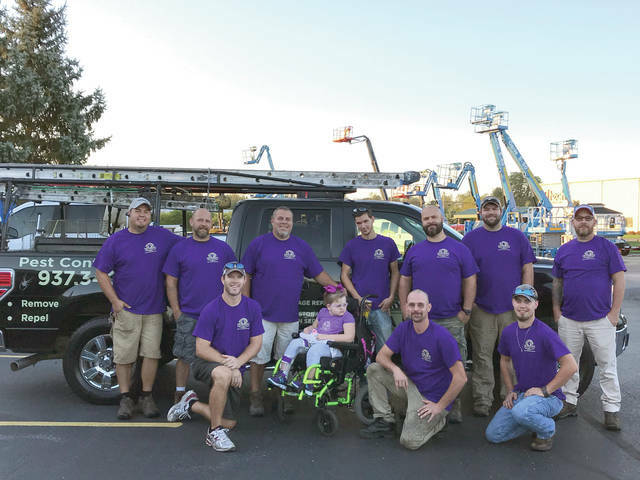 In recognition of Rett Syndrome Awareness Month in October and in honor of Leah Hatton of Tipp City, the employees of Barnes Wildlife Control will be wearing special purple work shirts. Leah’s mother Lisa works for the company and Leah recently made a visit to BWC. Rett syndrome is a rare neurological disorder that almost exclusively affects girls. It typically develops in the first two years of a child’s life and can lead to severe impairments. https://www.weeklyrecordherald.com/wp-content/uploads/sites/51/2018/10/web1_IMG_5828.jpgProvided photo In recognition of Rett Syndrome Awareness Month in October and in honor of Leah Hatton of Tipp City, the employees of Barnes Wildlife Control will be wearing special purple work shirts. Leah’s mother Lisa works for the company and Leah recently made a visit to BWC. Rett syndrome is a rare neurological disorder that almost exclusively affects girls. It typically develops in the first two years of a child’s life and can lead to severe impairments.